This biography may contain mature themes at times. Viewer discretion is advised. Beware of hidden scrollbars. Best viewed in Google Chrome. Nemesis is a character and her actions do not represent her player. I do, however, take full responsibility for her. If you would like to contact me for whatever reason, feel free to do so here in the comments or privately. RP and in-Forest interactions always welcomed! RP preferred via Skype/Discord - please, don't hesitate to add me. The original idea for her past was taken from Philip Pullman's trilogy His Dark Materials. || NoteMostly in the 'lone' world. "Nem became an ocean-scented essence of loneliness." Some updates to reflect her personality change over the years. (11.10.) Arrived to rain washing away the traces of the Rut. (4.10. 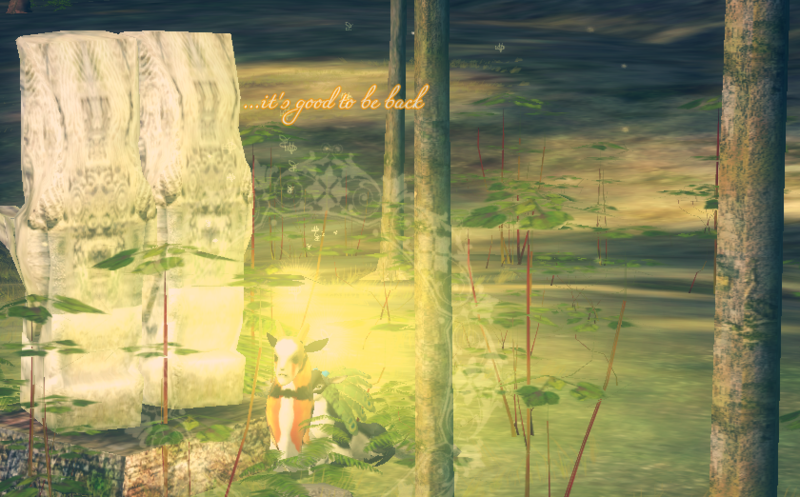 - Rut, day 7) Took note of Anker at the Pond when entering the Forest, though drifted away to the Ruins. Sat on her own before being approached by Elijah. Spent a good while in the hound's pleasant company, before the Rut activities picked up. Joined Oromë and his group after his spar with Elijah. Grew discontent with how Cadaver was treated when he showed up to lurk among the herd, though placated somewhat by Elijah's attentions. Sided with Akil after his spar with Oromë and joined his herd. However, became fatigued and discontent once more, struggling to keep up with the tussles around the group so took her leave and settled in her spot for a nap. Woke up to Tristan by her side, exchanging some sleepy words. (3.10 - Rut, day 6) Unimpressed with the Rut activities she witnessed, "took" the hill near the Ruins and stayed there, not really siding with anyone. Got to interact with Lalitha, Tris, Averell, Altijd and Ephiré. Wandered on her own before leaving the Forest for the night. (2.10. - Rut, day 5) Woke up in the Forest, pleased to find that Tris kept his word once again and didn't abandon her during the night. Relaxed for a while before making the move to get involved in the Rut activities. Watched Tris challenge and spar with Luc, nothing won, nothing lost. Stayed with the piebald and the group he collected (Gaea, Jonah, Raizel, Alchemilla, briefly Dare), listening in on the conversation between him and Jonah, finally putting one and one together. Then Pagan showed up and won everyone over, including Easca and Mirah. Charmed by the masked doe's attentiveness to the group once again. Then things turned blah with Brent's arrival, distressed by his behaviour, grateful that Jonah and Pagan kept him away from the group. Stepped away from the herd when she sensed Tris and Wardell not too far off, intrigued to see how their spar would go. Allowed Pagan to lead her back to the group afterwards, though didn't stay for long, still unsettled by Brent's visit earlier. Headed to the Pond, had Tris check on her before she departed to the lone world. (1.10. - Rut, day 4) Wandered, not finding Rut action anywhere. As a last resort, called out and got answer from Tristan so followed the call and got invited to his group (Alchemilla, Lilu, Erwen, nameless doe). Nothing was happening and then everything was happening. Very close to chasing Arlo off but luckily Tris helped him get the hang of it. Eyed the approaching creatures (Oromë, Elijah, Shahla) and the spars that happened as a result of the tensions. 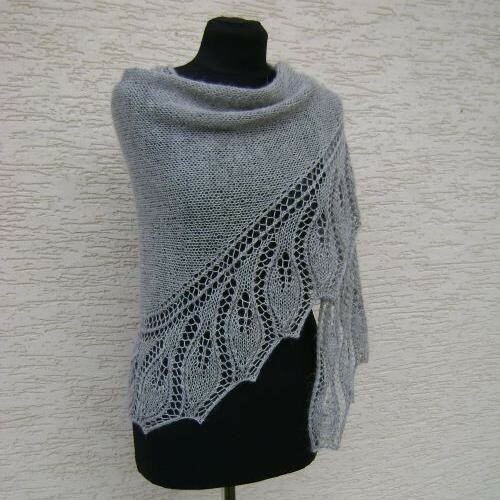 Won over by Elijah, though the hound seemed to be more interested in Alchemilla, Jovan and the company at the bar. Played hard to get when Tris kept on gravitating towards her since he technically didn't win her favour. Spent the night by the piebald's side when invited to. (30.9. 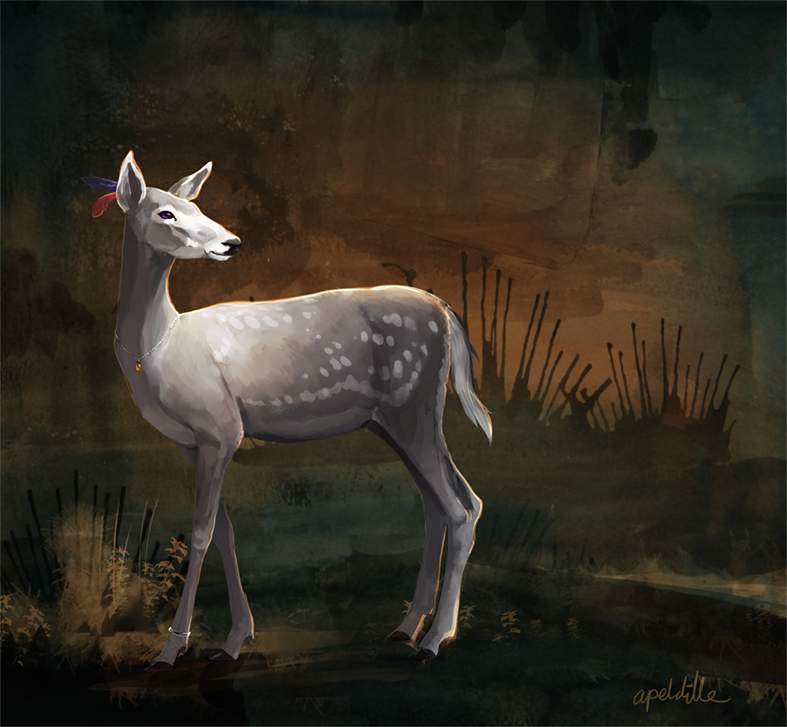 - Rut, day 3) Returned to the Forest after spending some time in her world. Put herself, very hopefully, between several smaller groups but no one seemed to pay much attention and there were no spars that she could see. Kozan to the rescue! Glad to hop around and join him for a bit. It was short lived though, when Pagan arrived and showed she's more than sweet talk but can also stand her ground. Stayed close to the masked doe through the rest of the night, keeping an eye on the happenings in the herd all the while (awesome fawn, Tris vs. Acturus, Jonah, Tris giving her flowers, Gustiro vs Jonah). Very keen on a particular moment when she had both Pagan and Tris grooming her back, yes pls. Exchanged some words with Pagan, and was introduced to her adopted daughter Nawfar. Left to spend the night in her world not long after that. (28.9. 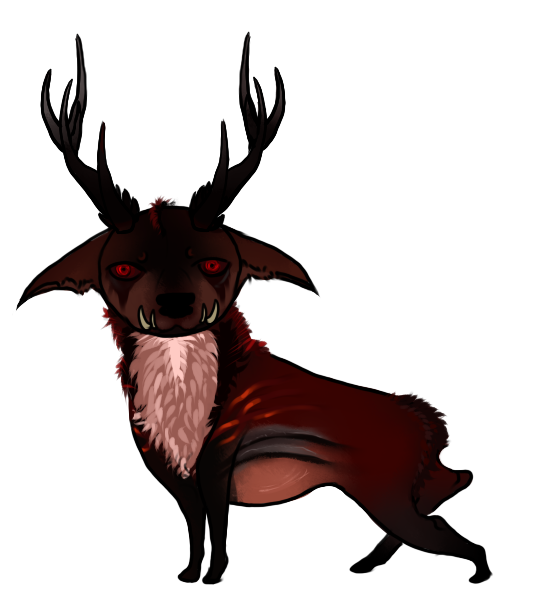 - Rut, day 1) Paced the Forest way too many times, aware that the event began but too hesitant to dive right in. Made a beeline to Cu when she sensed his presence, goofing off and feeling herself relax and shake off the tension. Parted ways when Cu's friend (ro) joined, glad he had company and she wouldn't have to feel guilty about leaving him to dip her hooves into the event. Collected by Sabit and very impressed with how he tended to his herd, further impressed when she had the opportunity to watch him show off his skills when challenged (by Tris, and Akil). Jonah won her favour when it seemed he actually chased Sabit off. Followed Jonah to his group and got some grooms so yay. Watched Tris spar with Ingolfr and later Akil, but could tell the piebald had enough so didn't follow when it seemed he was taking the group away to challenge someone else. Didn't want to support that. Slunk off to her sunspot when the group left, winding down after the eventful day. Was joined by Tris and they spoke about their impressions from the first day. Invited him to stay for the night when he was getting comfortable and made a request, feeling more relaxed when he agreed, drifting off to sleep in the Forest for the first time in months. (27.9.) Restless just like the previous day, trotted all around the Forest, settling in places. Lingered near the Old Oak later on, sensing someone's slow approach. Found herself in Wardell's delightful and calm company and remained next to him till it was time for her to leave. (26.9.) Wandered the Forest restlessly, settling down here and there before returning to her spot. Not impressed when strangers and Tristan crowded the place, the doe removed herself from the situation by walking off, hoping Tristan would understand. 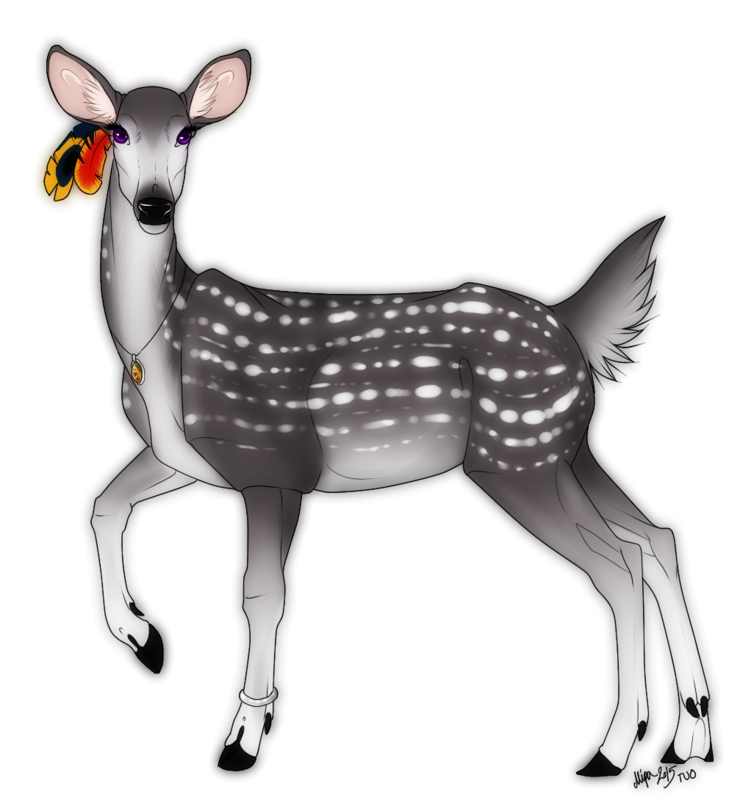 Subjected the piebald to high levels of sass when he showed up again and agreed to meet more of his friends. 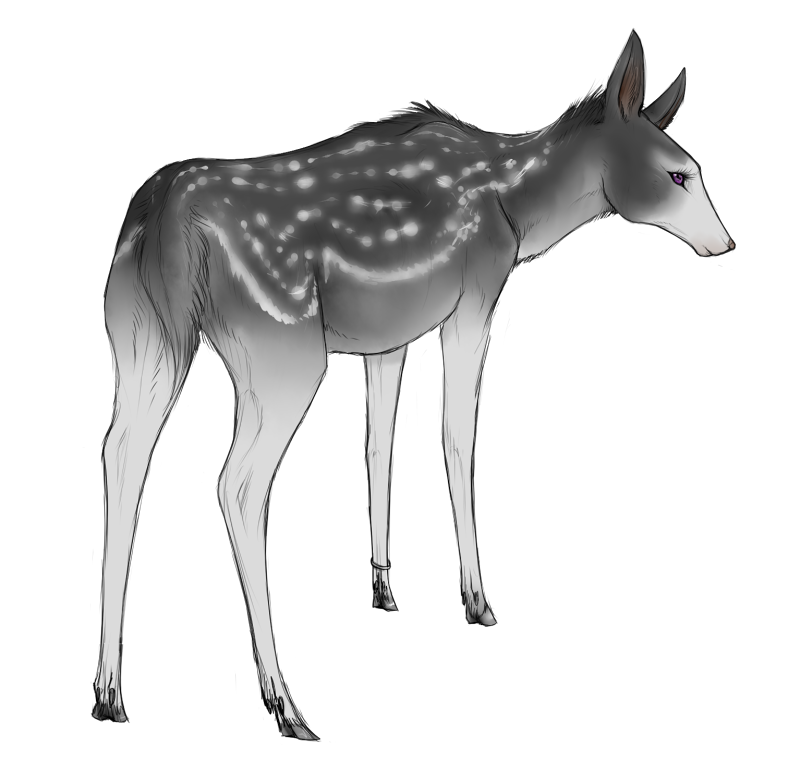 Was led over to a nest and introduced to its owner, Alchemilla; familiar doe whose name she didn't know, Artemis; and Elijah, someone she'd find intimidating if it wasn't for the ease with which everyone treated the hound. Put further at ease as the introductions and conversation flowed, until it didn't when a commotion drew near. On high alert along with the whole group though stayed low, even more so when Zash showed up. Didn't see the Gray in what felt like forever, extremely nostalgic and thinking back to the time years ago when he was the only one she knew. Happy to see him alive and well and comforted by his presence. Kept an eye on everyone when they came back after the fight but didn't intervene except for checking Tris over before she left the Forest. (22.9.) Returned to the Forest after a night in her world. 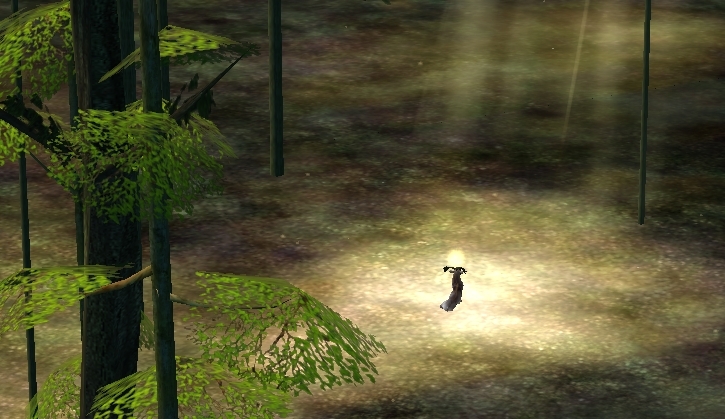 Paced around the Forest, eventually settling at a spot from which she could watch her sunspot. Approached by someone she was unfamiliar with, Gristalf. Spoke to him when he initiated conversation, somewhat confused and quietly suspicious when he seemed to contradict his own words. Took part in another conversation when Tristan arrived with his friend in tow. Intrigued by Pagan even though her first words sounded so fake to the grey that she immediately called the masked one out. Despite that, couldn't help it but invite Pagan to try again sometime. With Gristalf and Pagan eventually leaving, sat with Tristan in silence for a while before leaving to her own world. (21.9.) Spent couple of hours settled in her favourite sunspot, tentatively trying to use some of the skills she learned during her absence. The Forest felt rigid though, and not pliable like her lone world. She noted this not with disappointment but merely as a fact serving her to learn more about the true nature of her own world. Was about to leave, marking her trees, when a familiar face showed up. Reunited with Tristan after way too many months. Spoke about the upcoming Rut, gushing about how empowering it is for her to see does take up the roles of Challengers and Competitors. Put a gentle stop to his advances and slipped away to her world. (11.9. 2018) Back after long absence. Drawn to the promise of the approaching annual spectacle in the Forest. The doe had spent most of the year experimenting with the very fabric of her lone world. Tristan's visit late last year offered a few interesting insights into the connection between her and the land she occupies. Wasn't previously fully aware just how much she is part of the land and how much her thoughts influence her space. Her exercises were unsuccessful at first, leaving her to believe that perhaps it's more about her simply imprinting her thoughts into the material world around her. After all, that's what Tristan picked up on, her thoughts seeping from every grain of sand. But there was also certain sentience about the world and the way it almost worked as an extension of her. She would settle down at a spot on a remote beach every afternoon, face the sea, and focus her will on reshaping the coast behind her. The results varied from her getting soaked as the tide came in to her falling asleep as the afternoon sun and the sea air lulled her into a nap. The doe had given up few weeks into the experiment, when she couldn't pick up on any tangible changes at which point she also convinced herself she lost her mind. 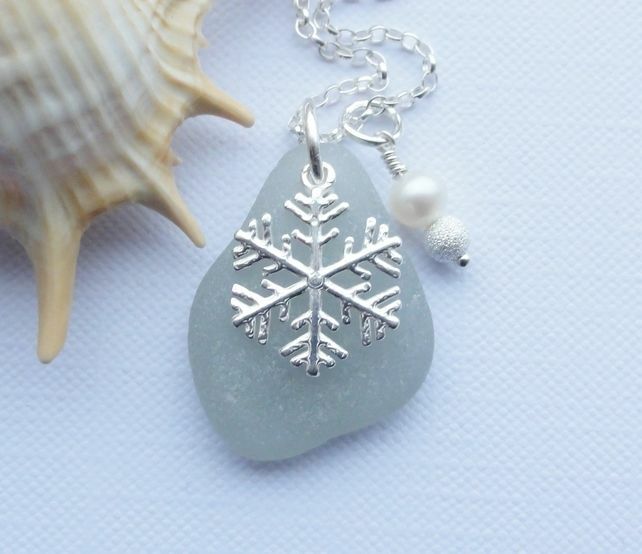 Returned to the idea when the sea washed up several perfectly shaped pieces of sea glass after she intensely wished to find them as they would exactly fit the sea glass mandala she was making. Revisited the remote beach and instead of trying to reshape the entire shoreline, she focused on a much much smaller goal, devoting herself to the task for weeks once more. Real name: Zoe Summers Her human name unknown to others in the Forest. Met the male during the Rut (2013, Good Lord). Possibly had a crush on him at one point. One of her oldest friends, welcomed back after his long absence. Shared history, fond memories, nostalgia. Mischief. Fun. Familiarity. Hasn't seen in a while. Happiness. Warmth. Familiarity. Adoration. A long time friend she always enjoys meeting. Met the masculine doe during the Rut (2014) and found her and her strength rather enchanting. Admires. Still visits from time to time. The male became her most constant company over the past few months. Reserved towards in some ways but for the most part grateful for his company and patience with her outbursts and moods. Mischief. Happiness. Adoration. Fun. A long time friend who is always welcomed with nuzzles. First deer she became friends with in the forest. Looks up to him and trusts him. Finds him interesting to talk to. Sometimes tends to care way too much about his opinion. Happy to see him and his family around. Source of nostalgia but also comfort. Confusion. Admiration. Rut affair (2015). She found his attention lovely at first but as she got to know him better, her opinion on him changed. 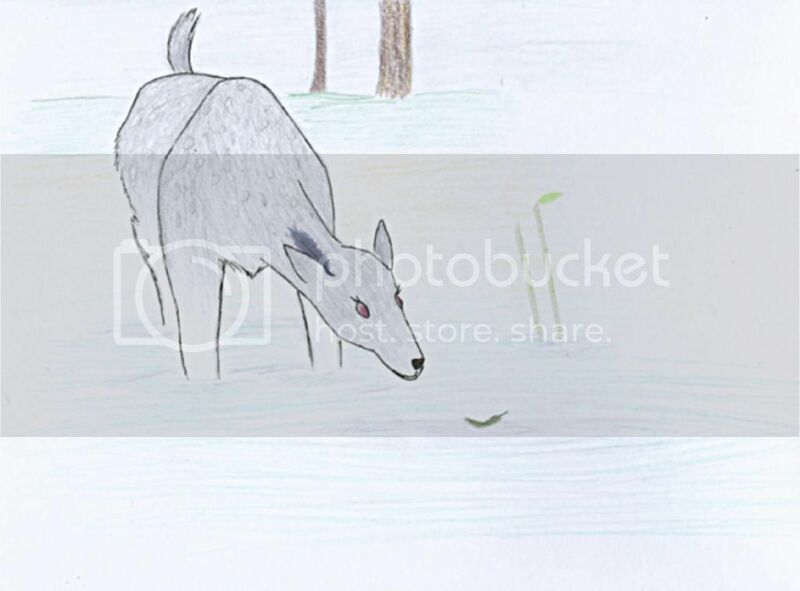 Despite this she gave the stag a second chance because things went downhill. This only led to more disappointment. Gone. Forgotten. Was attacked by the beast which is something she'll never forget. The experience somewhat helped to shape who she really is. Paralysed with fear whenever this creature is around. Keeps and still wears the necklace from him. Serendipity. Met the huge stag by chance on a beautiful snowy day and then they shared many ups and downs. Developed strong feelings for the male as the time went on and eventually vowed to be his. Everything took a turn for the worse after their visit to Adil's world when the male ended up being 'possessed'. Hadn't seen him since and believes him to be gone forever. Blames herself for it since she was at the time too weak to help him escape from the grasp of what was possessing him. In denial after seeing him again, believing it was just an illusion and he's indeed gone. Ready to question him on a single specific matter if she ever catches wind of him again. Feels he owes her an answer, obsessively giving the question and any possible answer more importance than she should have. A complicated relation due to his close friendship with Adil. Her view of him is often twisted by her jealousy. More than happy to spend time with him on her own but inclined to leave should Adil be around. A young lady she watched grow up and turn from a cute little fawn into a beautiful mature doe. Still motherly towards though. Associated with Stym. Always happy to see her around. Cares about and will protect her if needed. Missing. Gone. Watched the buck grow up as the time went on. Received a very special feather from him as a gift. Happy to see him around. Motherly towards. Missing. Gone. Spoke to the male twice and grew curious about him. Interesting fellow. Hadn't seen him around. Gone. A relatively new acquaintance. Feline. Positive feelings. Fun. Doesn't seem to be remembered by the black lion. Severed bond. Protective of the blind buck. The only deer whose constant mooing she'll tolerate. Always happy to see him. Hadn't seen him around that much lately. Gone. Very good friend. Trusts. Grateful for the protection and support the feathered doe offers. Finds her attractive. Got two feathers from the doe which quickly became her treasured possession. Got recently introduced to her mate. Missing? Gone. The male quickly became a good friend and a play buddy to her. Associated with Stym due to their family bond. Missing. Gone. Presence of the unicorn gave her the strength to say "no" to Tago. He also helped her after she was attacked. Fading feeling that she owes a lot to him. Rekindled friendship? Missing. 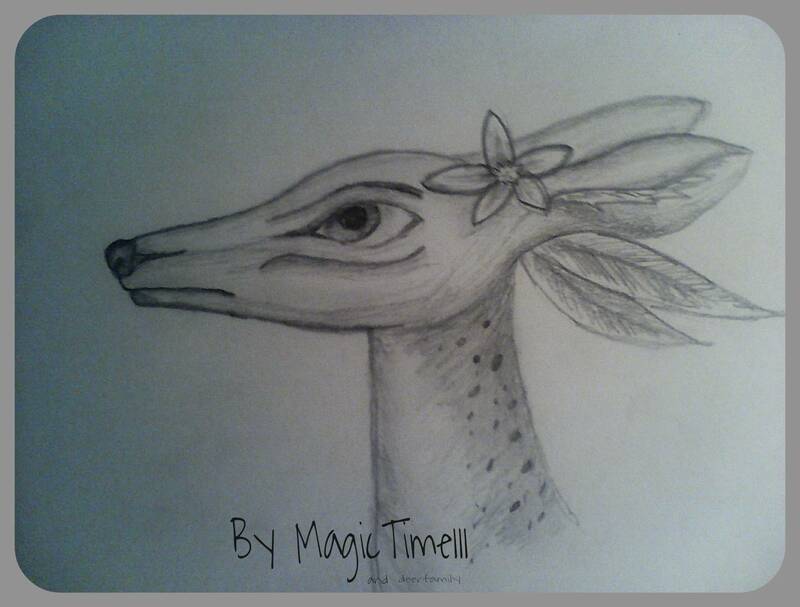 Lovely stag she enjoys spending time with. Missing. Gone. Spoke to the white male only twice but seen him around often enough to consider him a friend of sorts. Curious about. Gone. Odd fascination. Spoke to the male and was given a scarf from him on a particularly rainy day. Missing? Gone. Best friend. Feels safe in her presence. Sisterly figure. Admires. Source of comfort and happiness. Always happy to see her around. Priority. Missing. Gone. Nem considers her a very good friend. Together they are always up to some mischief. Missing. Gone. Friend. Truly enjoys the doe's company regardless of what they are up to, be it running around the forest or resting. Doesn't see her too often. Gone. I always feel like I am forgetting someone. 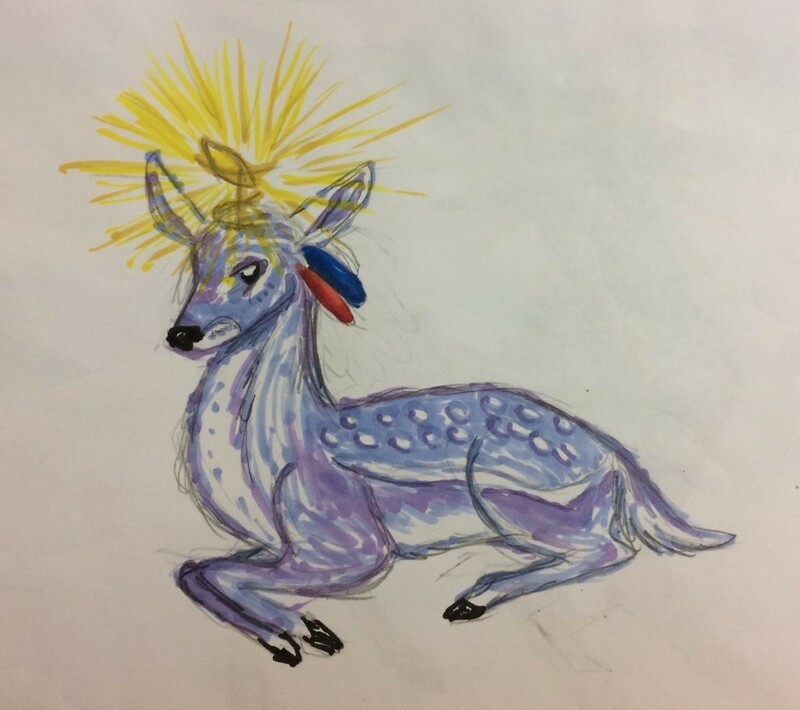 Asterisk (*) is used to mark deer without bio/whose player is not active on the community. 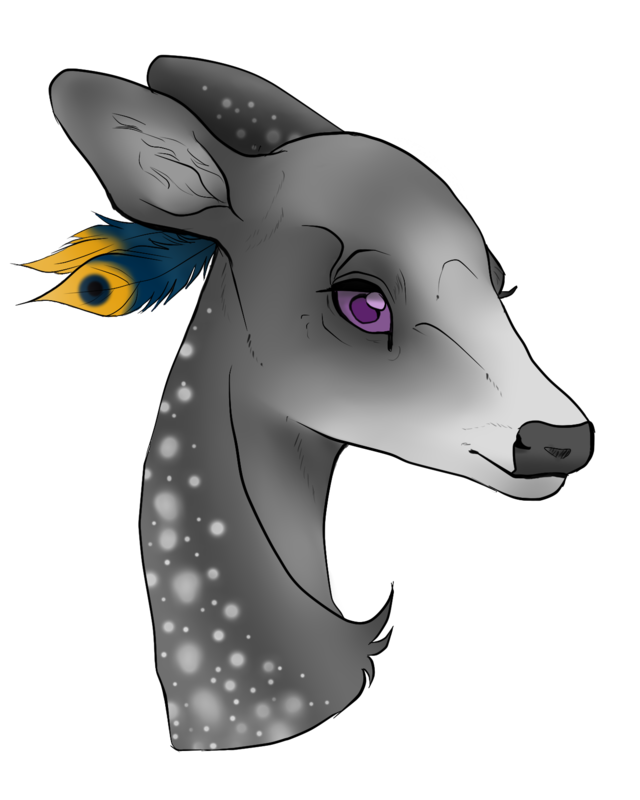 Sorry if I forgot your deer, contact me if you want your deer to be removed from the list, just trying to keep track of everyone she met. I don't feel like deleting the names from the seen list even though the deer is no longer around. This is only going to grow it seems. 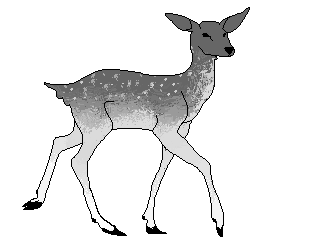 The doe has a simple, elegant, feminine appearance and is rather small in size which makes her look fragile. 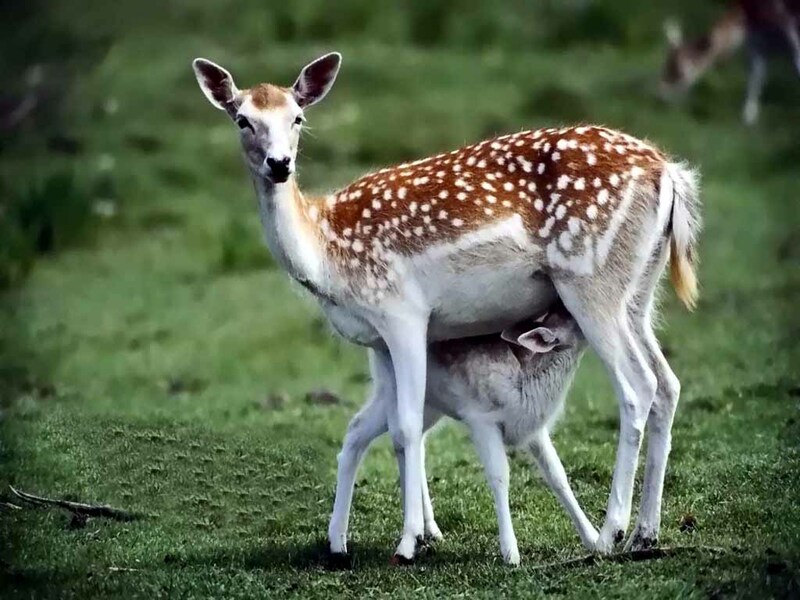 She has a body structure of fallow deer. Her legs are almost white and upper parts of her body have dark grey colour. 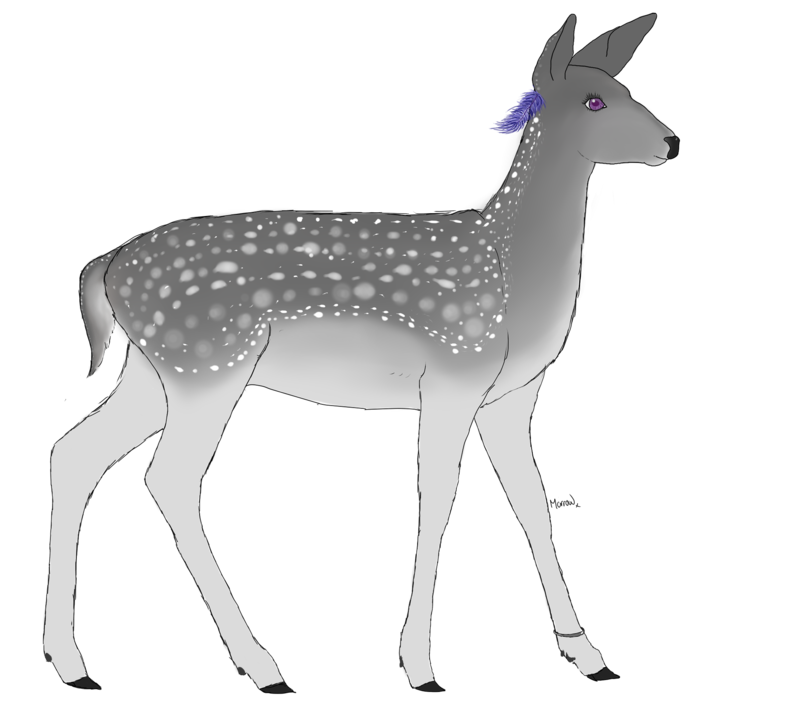 Her fur is decorated with markings similar to those on the summer coat of fallow deer. Her pelt changes with season, becoming silver during the Rut and darker and thicker during winter months. 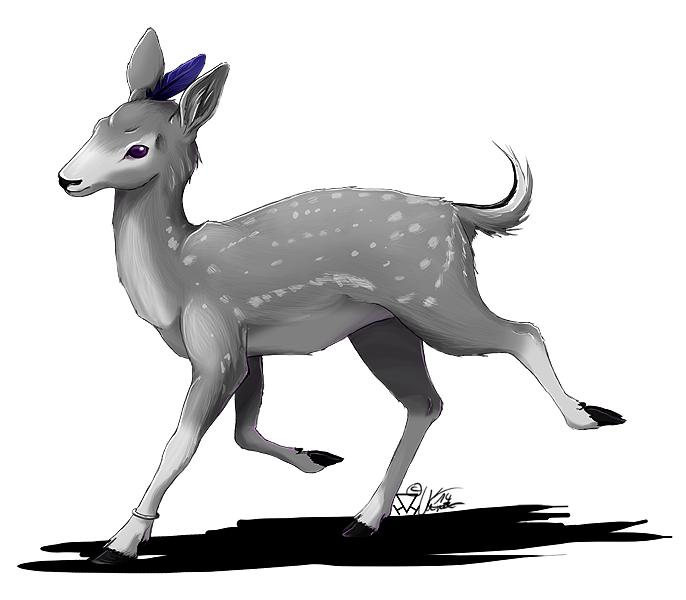 She has distinctive violet eyes and long eyelashes, her eyes generally drawing attention to her delicate, antler-less head. She has silver ring around her left front leg and a necklace with amber pendant around her neck. Behind her ear there are two feathers - one multicoloured and one red. Physique of a woman in her early twenties. Blue eyes with violet tint. Auburn hair. The feathers manifest in the form of tattoo behind her ear. Always has her ring and the necklace from Adil. 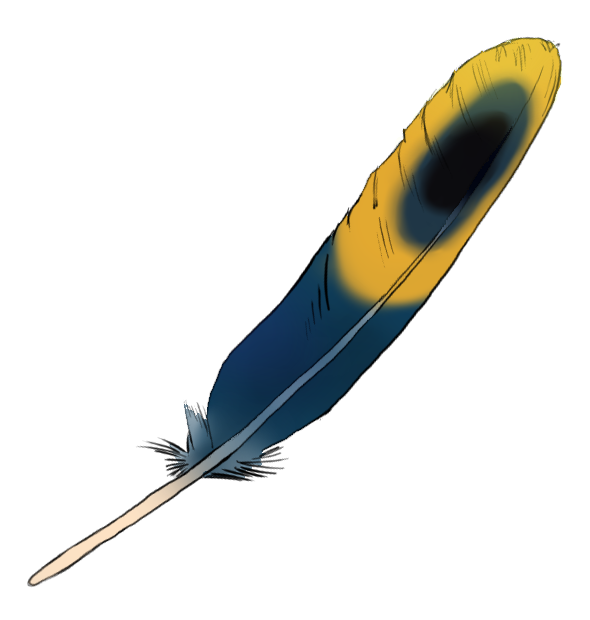 one multicoloured feather - x - given to her by Poetic, wears behind her ear since it was given to her, cherished gift. Used to have two of them but then gave the second one to Verve in exchange for a painted skull. There was a world much like ours, different only in one essential thing. Human beings were accompanied by their dæmons, physical manifestations of the human soul that took animal forms. There was a girl named Zoe whose dæmon was different from the others. It was natural that dæmons were of the opposite gender from their humans. Zoe's dæmon wasn't. Her dæmon, her Nemesis, as she was fittingly named after Zoe was born, was a female and a source of suffering for Zoe as she often got bullied for being “different”. She hated her dæmon for that at first, unwilling to accept her as a part of herself, causing both of them to be always unhappy and the peace between them often disrupted by fights. What was supposed to be two parts of one entity soon became too detached to be called “one”. Zoe loved city life, shopping, parties and most of all getting drunk so she could forget about her troubles and pretend that she had friends. At those times, Nemesis usually changed into a ladybug, hiding in dark corners of the room and pretending that she didn't exist at all. Nemesis felt best in silence when Zoe wasn't yelling at her, in a forest filled with its inhabitants. 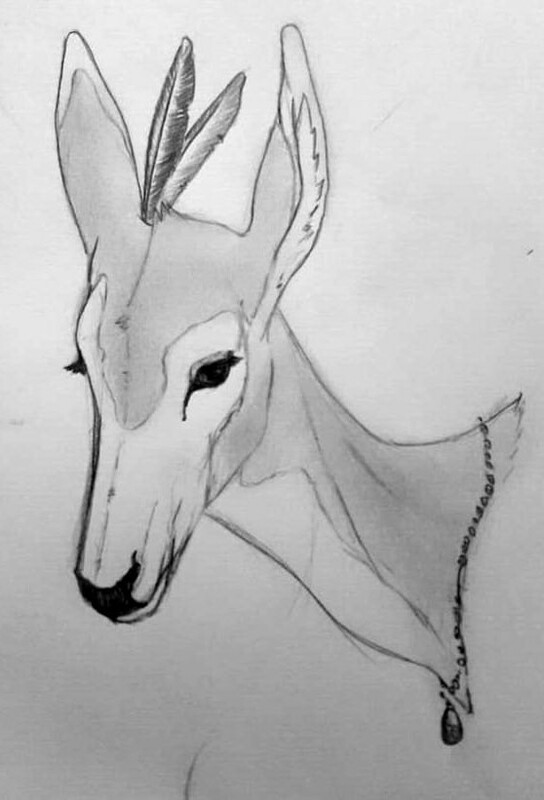 She often took the form of deer and went for long walks, dragging Zoe around with her as she explored the wilderness surrounding the town they lived in. They couldn't possibly escape form one another, human and her dæmon always connected by an invisible bond that doesn't allow them to get too far from each other without it causing pain. One day, after falling asleep in a mushroom circle, eyelashes fluttered open, revealing violet eyes that curiously examined the new eerie surroundings. 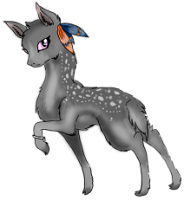 Taking the deer form of the dæmon and thoughts of both of them they finally became one and were given a new chance in the Endless Forest. Thank you! She really enjoys her time spent with Zash. He makes her feel safe. Aww ♥ I'm pretty sure that just made his day right there. Tracking for Keshadei and Lumilla. They are sitting with her and Zash right now. Keshy is Zash's daughter-in-law. Thank you! Nemesis is happy that she had the honour to meet them. ^_^ She's welcome around them anytime. Lumilla doesn't have a set of parents but she has guardians and parental-like figures, and Keshadei is pregnant so rests most of the time and eats mushrooms like you wouldn't believe, lol. Here's a track for Nemesis! Thank you! Nice to see Zeriah again. Tracking on behalf of Juggernaut. Thank you! If I remember correctly Nemesis already had the pleasure to meet Stymfalia! Hope to meet her again! The new art looks beautiful! Ohh that new(to me..haha) art of her is absolutely beautiful! She's such a pretty little lady. Taky zdravím a dekuji za track! Takove nadseni jsem necekala! Na TEF jsem relativn? krátce, jeste to nebudou ani dva mesice. Skype nevedu, jen mail. Tu radost ale vlastne chapu, taky me ta cestina dost prekvapila. Az tu budes dyl, budes mit zachvaty radosti z kazdeho cecha, co se tu objevi. Mimo nas, jeste Kikinkacze, a PLK217. To jsou zatim jediny aktivni, ale brzo je poznas. Díky, myslim, ze tu nejakou dobu pobudu, zatím jsem nadsena. Sorry to hear that! I hope they'll have the chance to meet under better circumstances another time. Awww there's no reason to feel awkward around him Nemesis. Hopefully it's just some phase and she'll be more confident in the future. I wouldn't want her to be awkward around him for the rest of her life. No, he wouldn't like that. tracking <3 thank you for helping Hyssop out with the mini spell! Btw I'd love to have either Hyssop or Caden rp with her to help ya out! I could toss Zash or Reate at her, but like you, I have no idea where to start. Skype or here is fine by me. Skype or here is fine by me. I'm not sure who to toss at her though. Zash possibly since he's known her a bit longer. I prefer skype as I don't feel confident enough to post my first RP attempt here. (My skype name is in the bio.) Feel free to add me and toss Zash at her. I have no words! That's so beautiful! Thank you very much! This is so unexpected and I don't know how to express how thankful and happy I am.... I love how you portrayed her (I literally fell in love with my own character all over again!)! I understood this sentence! Haha c: Our languages are similar.